NB. This new discussion has been augmented with some of my notes from the thread titled 'Xiaomi Yi or SJCam'. The most obvious improvement is in the software used to set up the gimbal’s control parameters. In the ‘old days’ you could spend hours adjusting the PIDs and still not get them right. The initialisation phase before each shoot required absolute stillness and could take up to a minute to complete and worst of all the gimbal could lose lock hundreds of feet in the air requiring a return trip to terra firma for a re-start……no fun at all! The new Tarot T-3D gimbal I have tested is a great leap forward by comparison. I’ve been flying it for a few weeks now and even in gusty 30 knot winds it has never lost lock. It initialises in a few seconds and best of all the main PID parameters are easily adjustable even when using cameras other than the GoPro intended by the manufacturer. But its main feature is the ability to vary the speed of rotation in all three axes to match the camera’s lens, ie slow for wide angle lenses and even slower for narrow or telephoto lenses. This enables perfect tracking and panning in the hands of a skilled operator. 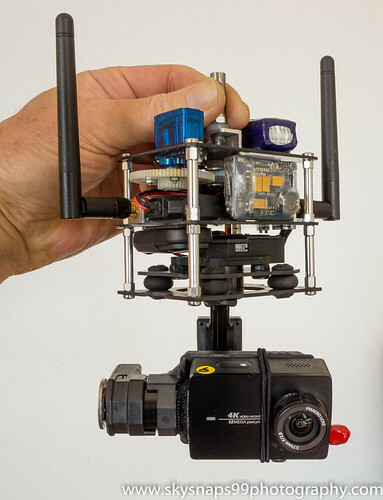 This rig uses the the Tarot gimbal plus an additional pan servo drive. The brushless gimbal has a panning range of +/- 125 degrees either side of centre with an allowance of 20 degrees more to cater for wind disturbances. This range is adequate for most circumstances but the ‘blind’ area behind the camera may well be of interest but inaccessible particularly after a change in wind direction. The pan servo allows easy centring of the camera prior to a KAV shoot ensuring the whole scene can be captured as the target object is tracked along it's path using the gimbal pan control. The Tarot and other readily available brushless gimbals are intended for the drone market and therefore the gimbal has been designed to follow the drone’s heading. Small unintended variations in heading are corrected by the gimbal while larger variations are assumed to be intentional and the gimbal will slowly follow, ensuring that the camera’s heading always aligns with the drone’s. The gimbal's pitch and roll motors keep the camera fixed at the right angle regardless of the drone or kite movement. So, a sweeping pan made by the drone is tracked by the camera which will also sweep around following the drone’s heading albeit more slowly and gently in line with gimbal’s internal settings. The downside of this is that when fixed to a kite string, significant changes in wind direction will mimic the drone’s sweeping pan movement and the camera will slowly track around to the new heading. In many cases this is of little concern since most videos require editing anyway and any unintended panning movement can be easily cut from the final version. But if you’re expecting a rock solid platform for your camera then a drone gimbal may not be your best bet. Perhaps others could report on their experiences and point the way to the perfect solution! Have you made other videos with your basket? For my part, I was able to build a pod that looks a lot like yours (sorry). I have not added a servo PAN yet and it is true that sometimes it is missing, but this basket already has a good amplitude at the start. I am obliged to have a mini camera in addition (fixed on the side), because my camera has no output fpv. The stability of this nacelle is very good after some adjustments (calibration, speed inclinations ....) However, the shots have nothing to do with those taken with a drone, but with a little imagination (he must multiply travel) and a good weather, this pod is doing a remarkable job. For now I use a Thieye camera and I do not know if this pod could support a GoPro 7 in balancing. Have you tried a Gopro 6 or 7? Congratulations on building and flying your gimbal KAP rig......no copyright on my design.....feel free to use it as you wish! I have made a new video of the kite surfers at Woodman Point but I'm not happy with the video quality as the sun is very harsh here, and strongly reflects off the water's surface. I have recently managed to obtain some polarising filters for the Xiaomi Yi 4k and hope to try these in the next month or so. Preliminary testing from the drone is encouraging so I have started using polarising filters on my other KAP cameras too. This is not really a problem with a drone since it is easy to move the camera's position so that the sun's reflections do not enter the lens....the kite however is a captive of wind direction. Sorry Herve, I don't have a GoPro so I can't give you any advice on that score. Brushless gimbals are beyond my technical capabilities. Love the work Al has done. Very impressive. I have taken a simpler approach.... GoPro Hero 7. I picked up the Hero 7 for some work on my sailing kayak and also some flying time on my KAP rig. I am impressed with the image quality and the smooth steady video results. See posts below a Kite Aerial Video (KAV) file straight off the camera (shot in 2.7K res.) on YouTube. On the sound track you can here the Sony A6000 being triggered with the CAMremote. You can also hear the servos moving. Thank you Al, I was able to edit some short videos (1 or 2mn), but I sometimes have a strong contrast and post treatment was difficult but mandatory. I think it's easier to shoot with a little overcast sky. I must say that the camera is not up to the height of a Hero7 but considering the price, I'll be satisfied with it (yet I am in awe before the video of ww!). After the shooting, I also had to stabilize some rushes on my pc because the vibrations are sometimes marked, especially when unrolling the line. Another observation is that you have to change as often as possible sector to have various views of the same subject ... I learn because I know nothing about video and treatment .... that happiness!